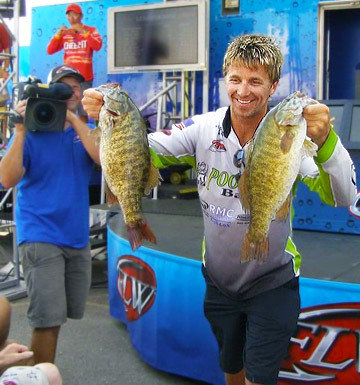 Chad Pipkens shows two of his big Lake Erie smallmouth bass to the audience during the 2012 FLW Tour Detroit River Open. Chad Pipkens is a professional bass tournament and Bassmaster Elite Series Angler from Holt, Michigan. Check out Chad’s Angler Profile for some of history about his fishing accomplishments, personal information, favorite place to fish, what he considers his strong suit in fishing and more. Chad competed for his first season in 2013 on the Bassmaster Elite Series thanks to his 2012 Bassmaster Northern Opens Points Championship! Pip now enters his 6th Elite Series season in 2018 with 2 consecutive Bassmaster Classic appearances! You can follow Chad on this website – check out his Schedule and Events Calendar – on Facebook at www.facebook.com/ChadPipkens, on Twitter – @ChadPipkens and on Instagram @chad_pipkens! Besides the 2012 Bassmaster points championship, Chad also won the co-angler title in his final tournament fishing from the back deck at the 2012 FLW Tour Beaver Lake event, took 3rd place in his first professional FLW Tour event fishing from the front deck at the 2012 Detroit River Open and won three Walmart BFL events in three years in June (2008-2010) on Michigan’s Burt and Mullett Lakes with amazing stringers of giant smallmouth bass weighing 27-05, 27-13 and 27-10! Chad is a smallmouth bass sight-fishing expert but has proven he can catch big sacks of bass throughout the year on many different lake and river systems.